Education For Choice: Have you heard about the condom train? Have you heard about the condom train? It was not until 1993 that condoms became fully available without prescription for everyone in Ireland. Access to contraception and reproductive control has long been a site of struggle for the women’s movement there. EFC volunteer Sarah McCarthy writes about the famous “condom train” where a number of women brazenly brought condoms into the Republic of Ireland on the train from Belfast. In May 1971, 47 women gathered at Connolly Station in Dublin, prepared to embark on a potentially dangerous endeavour to purchase contraceptives across the border. These feminists had planned an ingenious publicity-stunt; they were going to buy mass amounts of condoms and contraceptive pills, and challenge the customs officers on their return to arrest them for importing these illegal items. It was a bold move in the 1970's, and many were terrified about what their mothers would think. Upon their arrival in Belfast, they ran into one slight problem; contraception was so taboo in Ireland, that even most of these feminist women had never seen it in their lives. When Nell McCafferty, one of the founders of the Irish Women’s Liberation Movement, reached the pharmacy counter, she had no idea what to ask for. Eventually one of the divorced women in the group stepped up to the counter and requested condoms. However, at his point it dawned on them that the customs officials would have no idea what contraception looked like either. So they ordered hundreds of packs of aspirin, put them in paper bags, and pretended that they were contraceptive pills. Jubilantly, they got the train back to Dublin. As they neared the city, a few began to get nervous. What if they got sent to jail? What would their mothers say?! They clutched the statements they had prepared to hand to whoever would come to arrest them. However, the customs men were so mortified by their transgression that they quickly admitted that they couldn’t arrest them all, and let them go without challenge. The women walked through the station victoriously waving the contraband around, with some blowing up condoms like balloons. The response across Ireland was explosive, and the day’s impact lingered for decades. 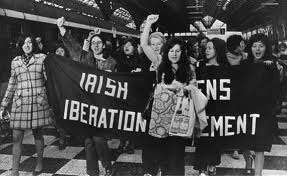 The Irish Women's Liberation Movement in 1971. Women in Ireland have long been subjugated by a deeply patriarchal state and the pervasive influence of the Catholic Church. In the 1920's the colloquial term for birth control was “race suicide” and “a child every year to you” a popular blessing. By the 1970’s, laws from decades back still governed women’s bodies. The 1929 Censorship of Publications Act allowed a board of five men to prohibit the sale of any “indecent or obscene” literature; including that which advocated birth control. The 1935 Criminal Law (Amendment) Act made the import or sale of any contraceptive illegal. Married women were expected to have as many children as possible and women who had children outside of marriage were often incarcerated in institutions run by nuns, called the Magdalene Laundries. Any promotion of contraception was also banned, leaving people woefully and dangerously misinformed. In the late 1940’s, a baby was born in Dublin with the top of a Guinness bottle on its head; the mother had inserted it in herself hoping it would act as a contraceptive. As women’s groups began to recognise the importance of accessing contraception, the Church vigorously resisted their demands. In 1968 the Vatican passed a Papal Encyclical, entitled “Humane Vitae”, which forbade Catholics from using artificial contraception. At the time of the condom train, a doctor could only prescribe the pill to a married woman with an irregular menstrual cycle. The criminalisation of contraception meant that women had no control over the number and spacing of their children; power over their reproduction lay in the hands of a patriarchal state. Thus the fight for contraception was one of the key battles for women’s liberation. In 1969 the Irish Women’s Liberation Movement and the Irish Family Planning Association (IFPA) were founded. They began to take direct action against contraception restrictions. In 1970 the IFPA began to give talks on contraceptives to women’s groups, despite the fact that even the promotion of contraception remained illegal. Soon after, Students’ Unions and Family Planning Clinics began to sell condoms illegally. They continued to do so against fines and public pressure. Many women’s groups pursued legal and extra-legal means to publicise and agitate for the urgent need for freely available contraception. The condom train was one amongst many bold and creative actions which openly flouted the prevailing conservative hegemony. In 1979 the Health (Family Planning) Bill was published, which allowed married couples to access contraception with a prescription. But it was not until 1993 that all restrictions around the sale of condoms were removed, and the morning-after-pill only became available without prescription in 2011. Arguably, the contraceptive revolution of the 1960’s and 70’s, and its long-reaching consequences, had a bigger impact on women’s lives than the right to vote. By 1991 the average fertility rate had plummeted to 1.89. Women gained partial control over their bodies, and much more control over their own destiny. Today, the fight for reproductive rights for women in Ireland is far from over. Abortion remains illegal, bar in certain exceptional circumstances. However, the horrific death of Savita Halappanavar has crystallised the pro-choice movement in Ireland, and I have no doubt that another struggle of direct action and mounting public pressure will eventually result in further gains for women in Ireland. Perhaps it is time to devise the Abortion Train! 'Youth For Choice' blog launches today! 'Pro-choice' - what’s in a name?